The TA400 ... largest in the range. With over 65 years of hauling experience under its belt, Terex Trucks is coming to bauma 2016 with a younger product pipeline. It will showcase an articulated and rigid dumptruck package that focuses on simple, uncomplicated excellence. 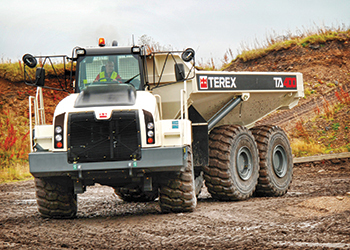 Despite the slowdown in global mining, quarrying and construction, Terex Trucks is undergoing a multi-million-dollar investment and product renewal programme. The first fruits of this can be found filling much of its 450-sq-m outdoor stand, in the shape of the TA400, its new, generation 10, 38-tonne articulated dumptruck. Featuring Stage IV compliance, the TA400 also offers improvements in quality, comfort and durability, as well as debuting a subtly revised livery. Alongside it will be the mainstay of the rigid hauler line – the 65 tonne TR70 dumptruck. “Our focus has always been on the needs of the customer, delivering robust, no-fuss machines that offer great return on investment. We’re looking forward to showcasing the substantial progress we have made over the past couple of years, and with much more to come,” says Paul Douglas, long-standing director and general manager of Terex Trucks. Featuring new livery and frontal design, the TA400 is the largest in the Terex Trucks articulated range. To guarantee maximum uptime of the truck, investments have been made to ensure increased durability and protection of truck components, including upgraded hydraulic hoses, electrical interfaces, transmission mountings and brake pipes. In order to prolong hydraulic component lifecycles, Terex Trucks has introduced magnetic pressure filters that reduce the risk of contaminants entering the system, and improves the cleanliness of the hydraulic oil. Further lowering operational costs, as well as enhancing safety, is the force-cooled multi-disc brakes. Supported by an electronic activated exhaust brake and a six-stage modulating transmission retarder, the TA400 benefits from longer brake component lifecycles. The transmission now features high performance oil that extends time between service intervals to 6,000 hours, and the powerful drivetrain maintains traction in even the most difficult terrain thanks to longitudinal and limited slip transverse differential locks. The engine and drivetrain is well matched, utilising automatic adaptive shifting and a pre-selected two-speed transfer box (drop box), providing good performance and productivity for all haul conditions.